Back in 1997, I was a freshman in college, at the venerable University of Wisconsin at Madison. I went into college pre-med — I had even attended a surgery during high school at Oconto Falls and did not faint. I thought I was meant to be a doctor. I was going to earn my degree and work to make sure more kids did not lose their grandmothers to cancer as I just had. Then I had analytical chemistry my first semester. I was one of those AP kids in high school; getting out of biology, calculus and English thanks to my testing. But I still had to deal with chemistry. And dealing with chemistry taught me that I was not cut out for pre-med and medical school. In my second semester, I was looking for a new direction. I found it in a class on radio, film and television history. I found it by learning that the real reason I wanted to be a doctor was because I was influenced by watching the NBC series ER. Yes, I had been media affected. Most importantly, I found myself by writing my first pop culture analysis paper. 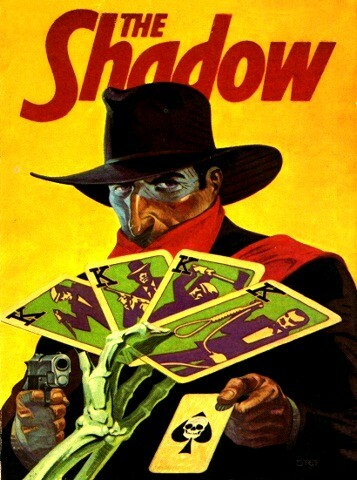 I wrote about the pulp character (some say superhero) The Shadow (as first portrayed on the radio by Orson Welles), and how the character was highly integrated into the historical mindset and environment in which he arose to popularity: The Great Depression. For the first time ever, someone either than myself or the TA can read the paper. Who knows what evil lurks in the hearts of men? The Shadow knows! Mwuahahahahahaha!